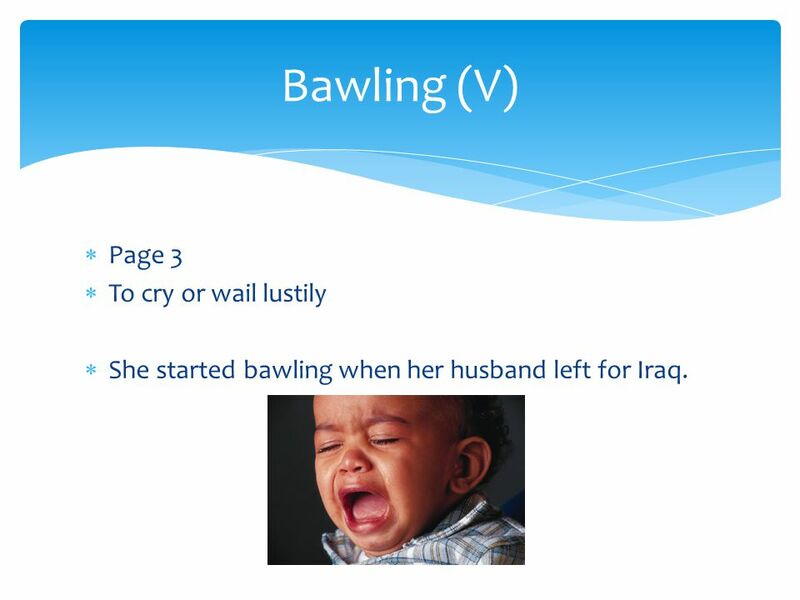 She started bawling when her husband left for Iraq. 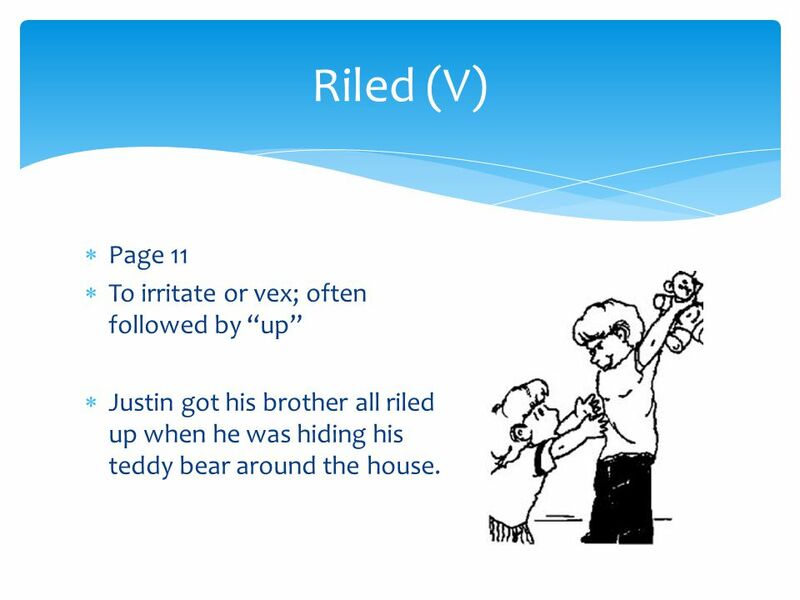 Justin got his brother all riled up when he was hiding his teddy bear around the house. 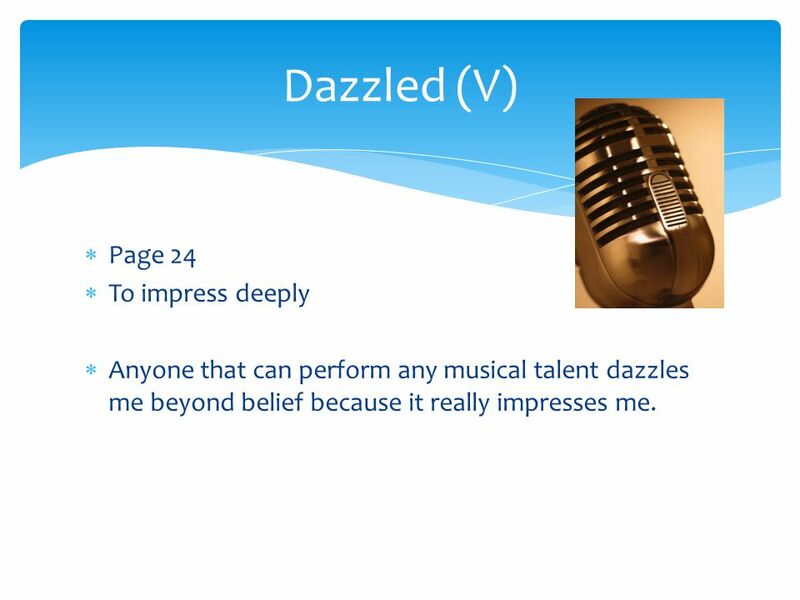 Anyone that can perform any musical talent dazzles me beyond belief because it really impresses me. The hurricane was so intense that it dazed me; I couldn’t take my eyes off of the damage it was doing. 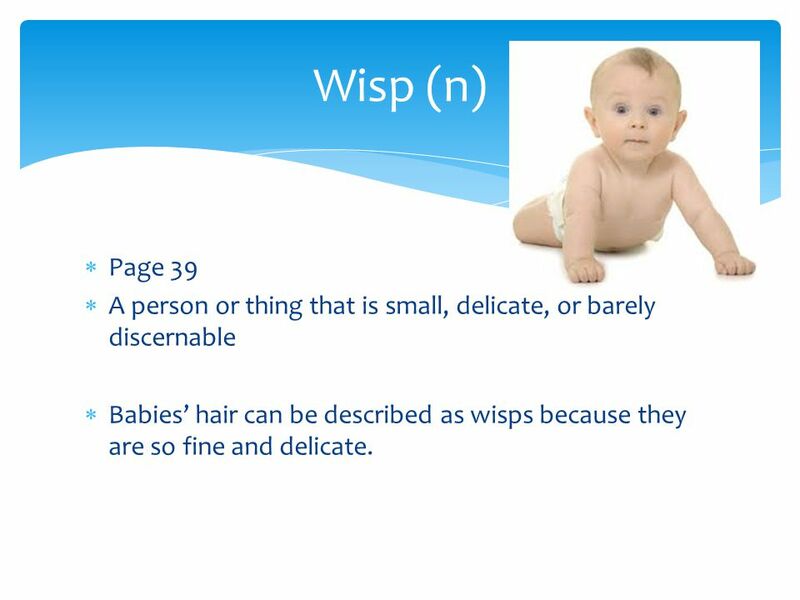 7 Wisp (n) Page 39 A person or thing that is small, delicate, or barely discernable Babies’ hair can be described as wisps because they are so fine and delicate. 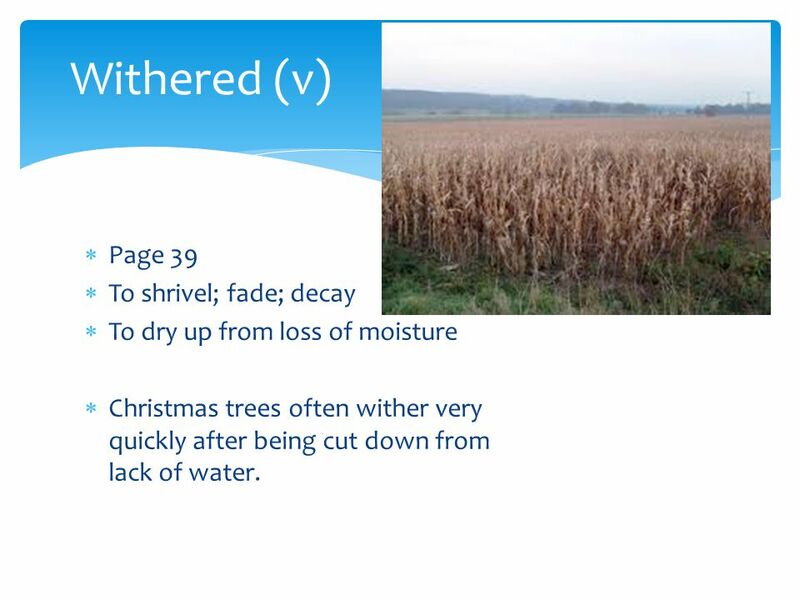 To dry up from loss of moisture Christmas trees often wither very quickly after being cut down from lack of water. 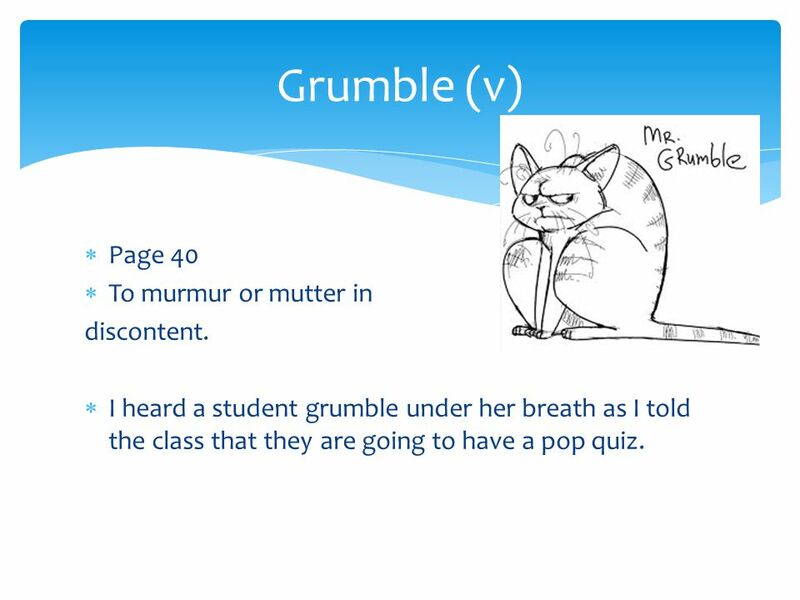 9 Grumble (v) Page 40 To murmur or mutter in discontent. I heard a student grumble under her breath as I told the class that they are going to have a pop quiz. 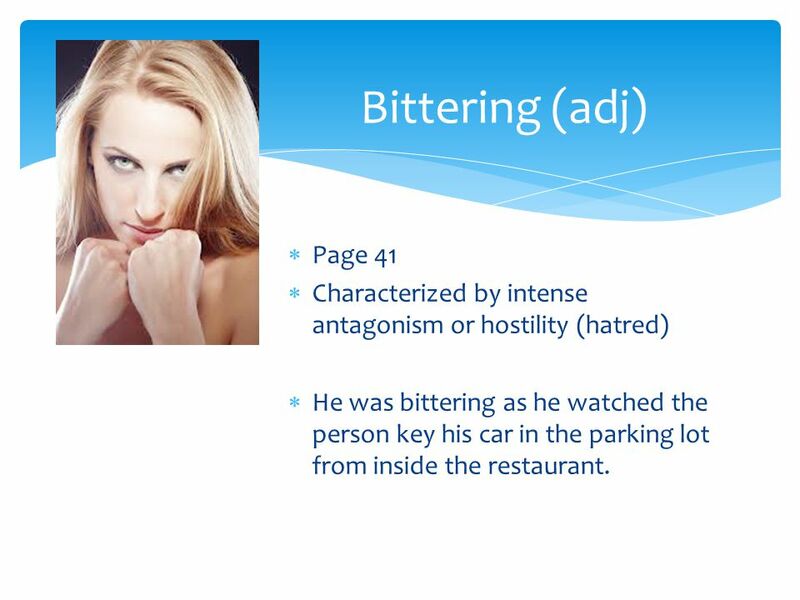 10 Bittering (adj) Page 41 Characterized by intense antagonism or hostility (hatred) He was bittering as he watched the person key his car in the parking lot from inside the restaurant. 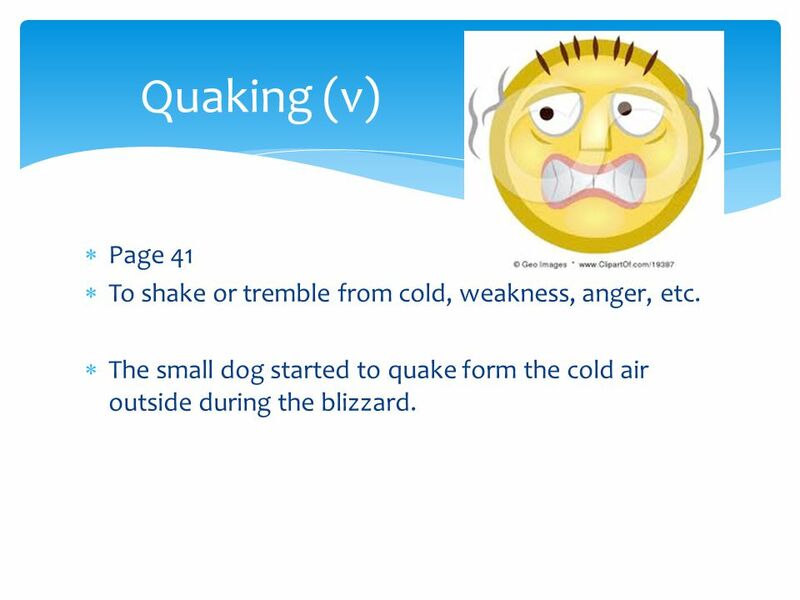 11 Quaking (v) Page 41 To shake or tremble from cold, weakness, anger, etc. The small dog started to quake form the cold air outside during the blizzard. 12 Simmering (v) Page 41 To be in a state of restrained activity, development, excitement, anger The little girl was simmering with excitement as she opened up the gift she wanted on her birthday; She tried hard to not get out-of-control. 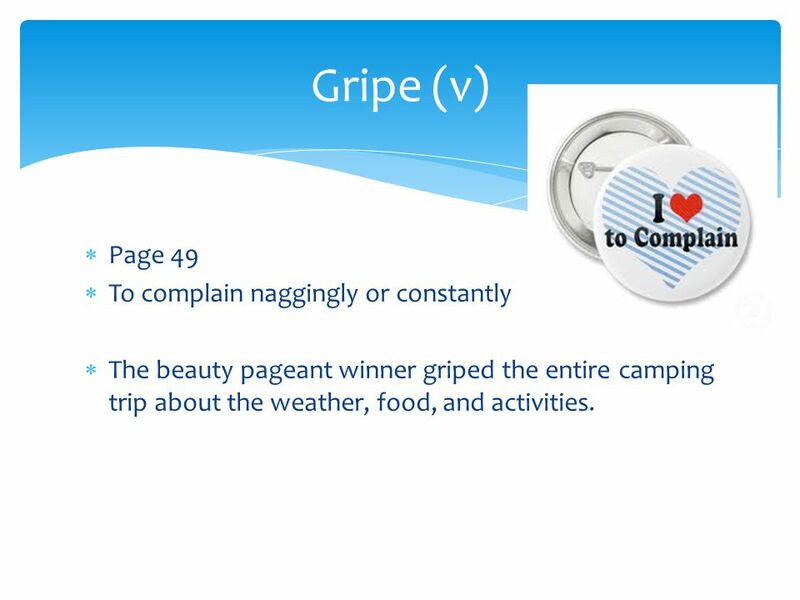 The beauty pageant winner griped the entire camping trip about the weather, food, and activities. 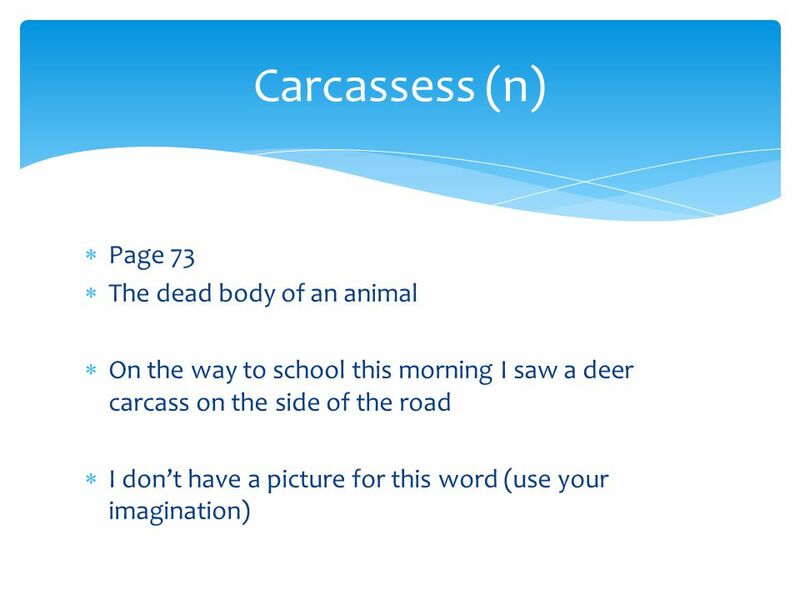 14 Kerosene (n) Page 60 Petroleum used as fuel, cleaning solvent, etc. 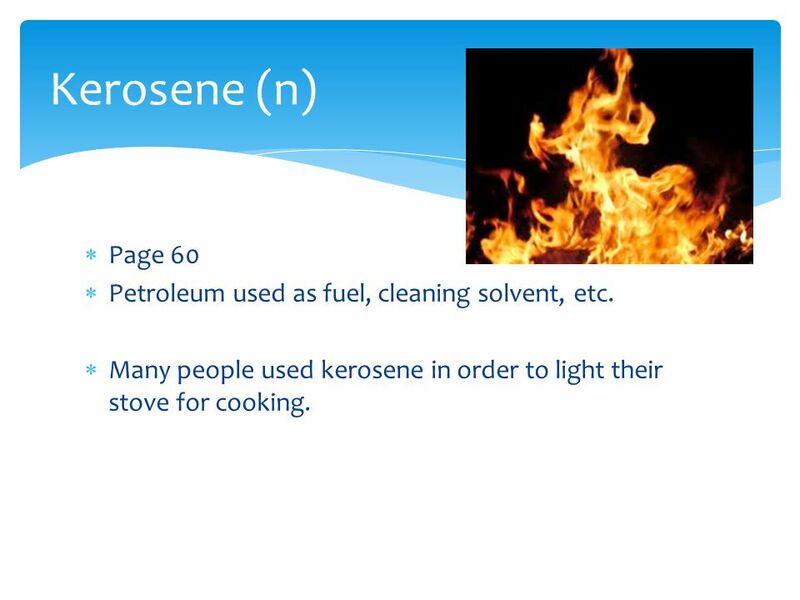 Many people used kerosene in order to light their stove for cooking. 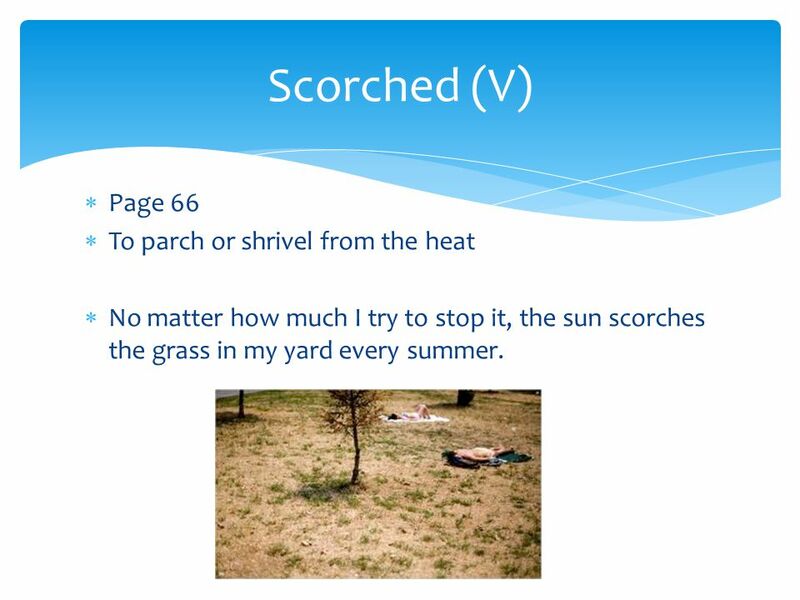 No matter how much I try to stop it, the sun scorches the grass in my yard every summer. 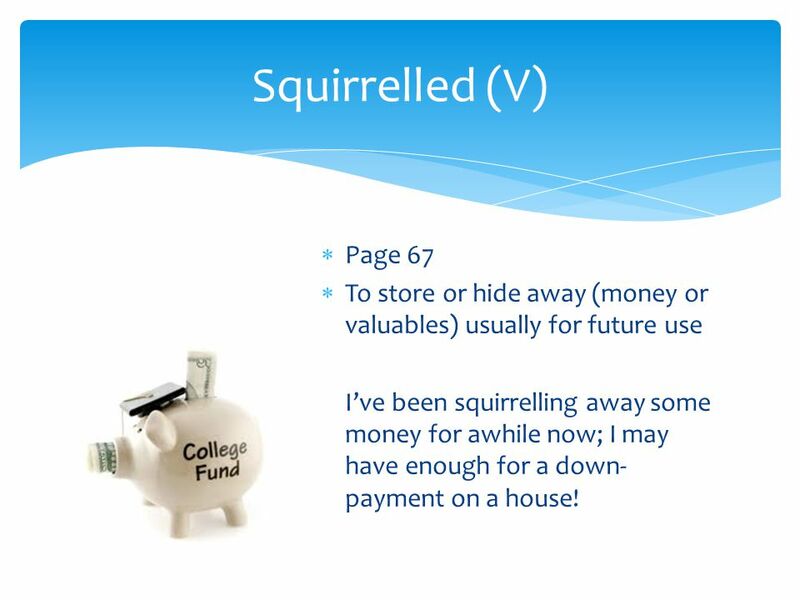 16 Squirrelled (V) Page 67 To store or hide away (money or valuables) usually for future use I’ve been squirrelling away some money for awhile now; I may have enough for a down-payment on a house! 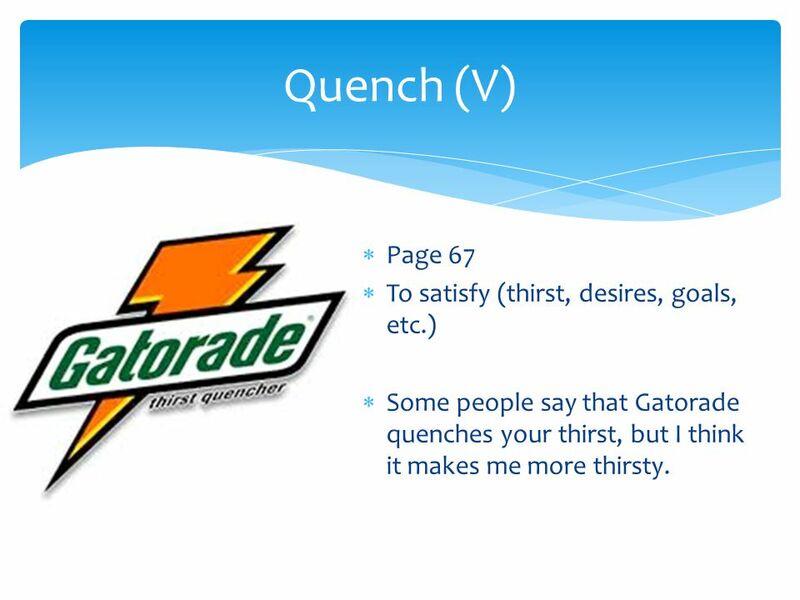 Some people say that Gatorade quenches your thirst, but I think it makes me more thirsty. 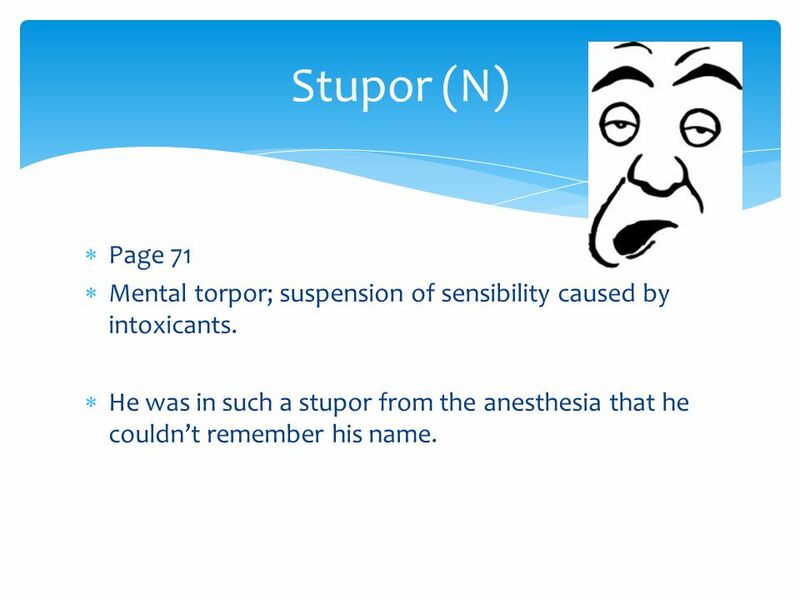 18 Stupor (N) Page 71 Mental torpor; suspension of sensibility caused by intoxicants. He was in such a stupor from the anesthesia that he couldn’t remember his name. 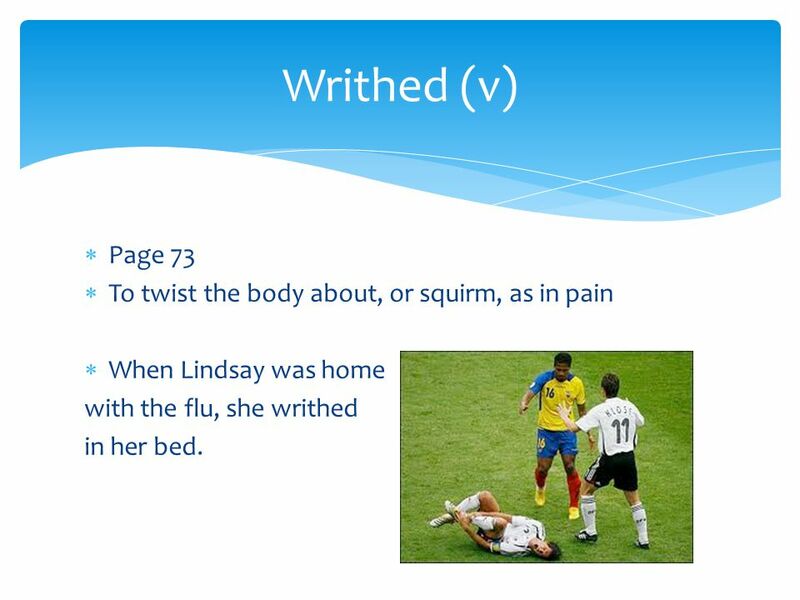 When Lindsay was home with the flu, she writhed in her bed. 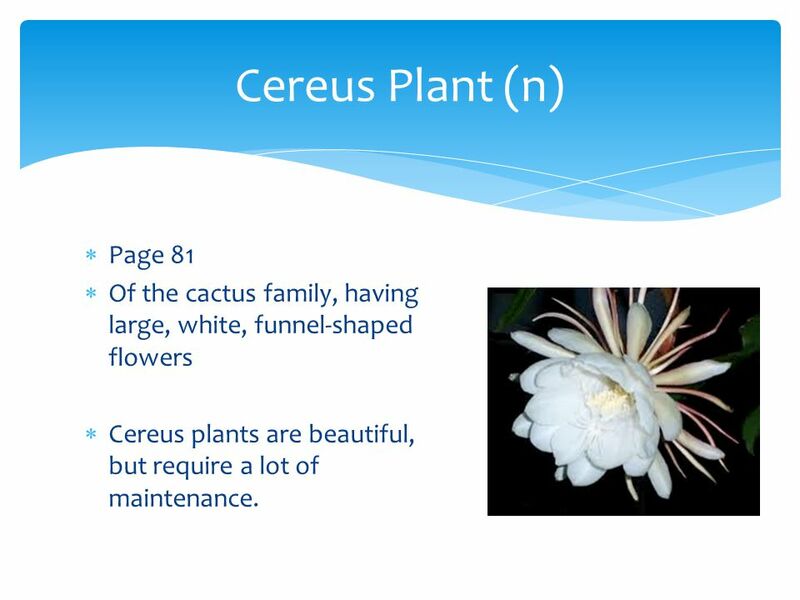 21 Cereus Plant (n) Page 81 Of the cactus family, having large, white, funnel-shaped flowers Cereus plants are beautiful, but require a lot of maintenance. 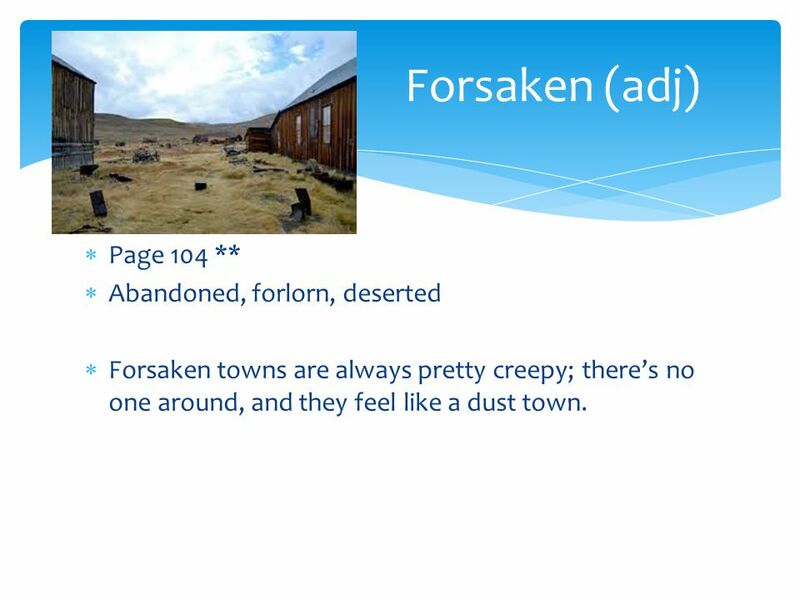 Forsaken towns are always pretty creepy; there’s no one around, and they feel like a dust town. 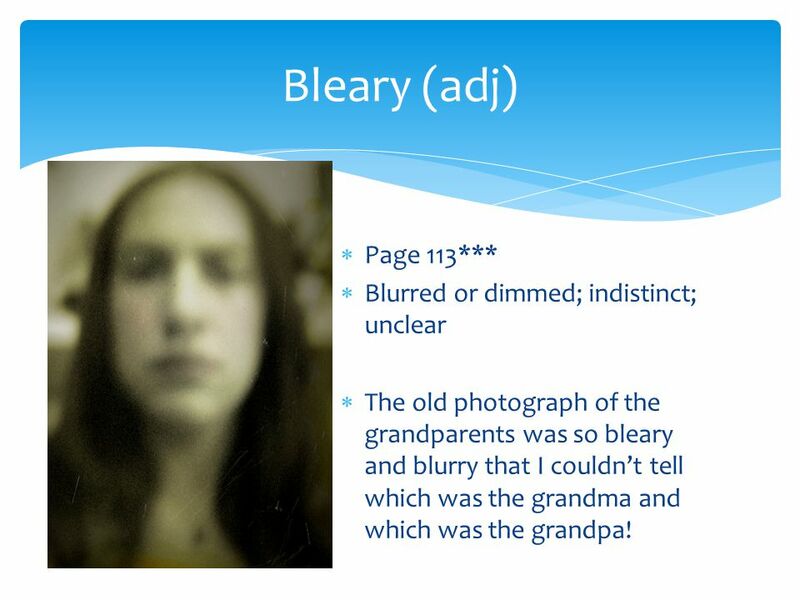 The old photograph of the grandparents was so bleary and blurry that I couldn’t tell which was the grandma and which was the grandpa! 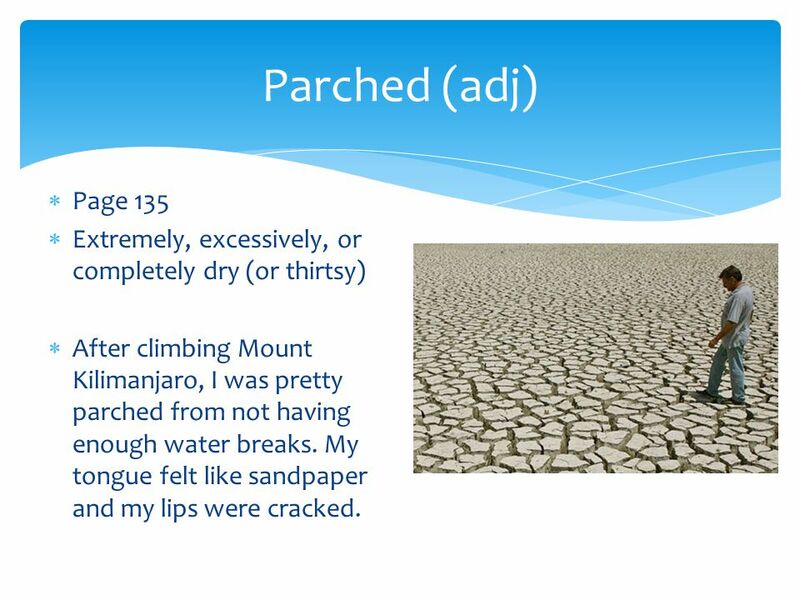 28 Parched (adj) Page 135 Extremely, excessively, or completely dry (or thirtsy) After climbing Mount Kilimanjaro, I was pretty parched from not having enough water breaks. My tongue felt like sandpaper and my lips were cracked. 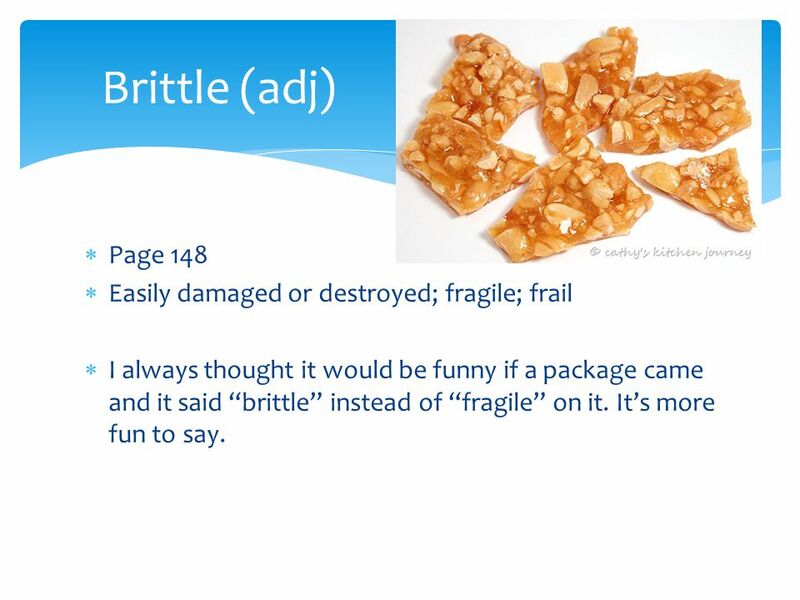 I always thought it would be funny if a package came and it said “brittle” instead of “fragile” on it. It’s more fun to say. 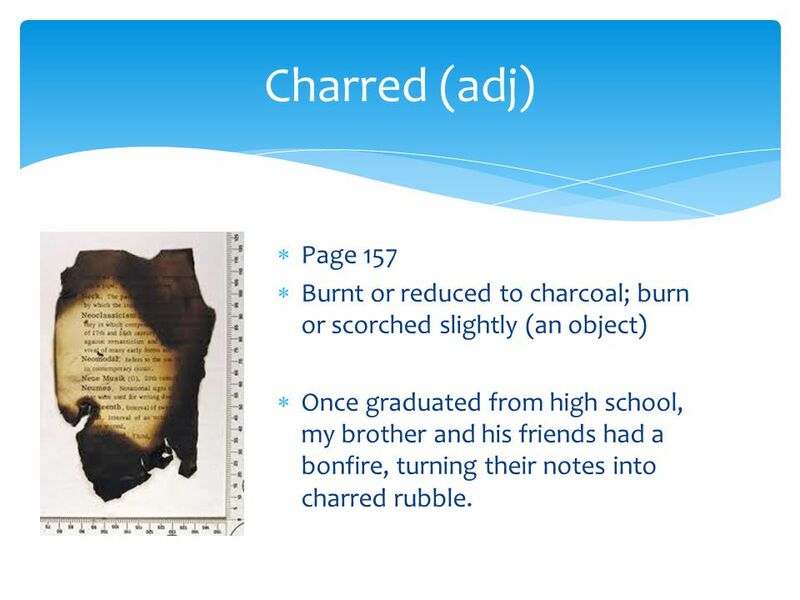 30 Charred (adj) Page 157 Burnt or reduced to charcoal; burn or scorched slightly (an object) Once graduated from high school, my brother and his friends had a bonfire, turning their notes into charred rubble. 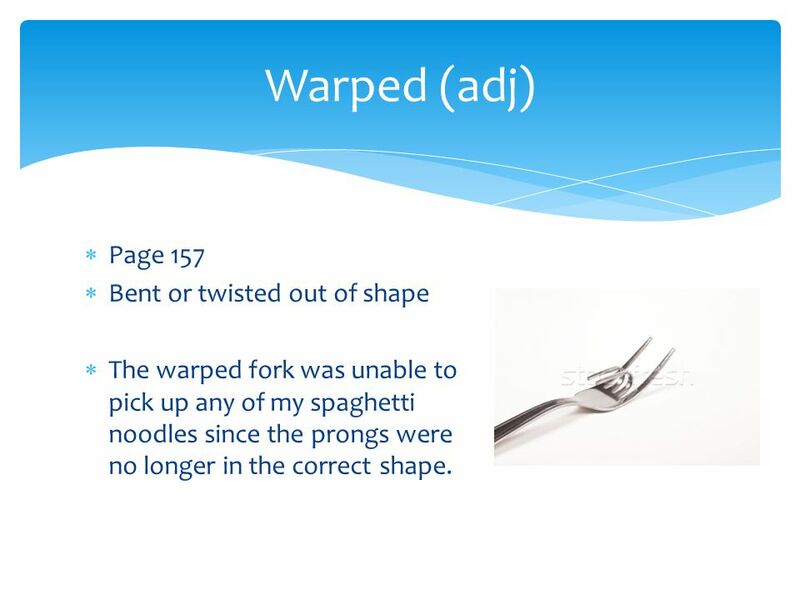 The warped fork was unable to pick up any of my spaghetti noodles since the prongs were no longer in the correct shape. 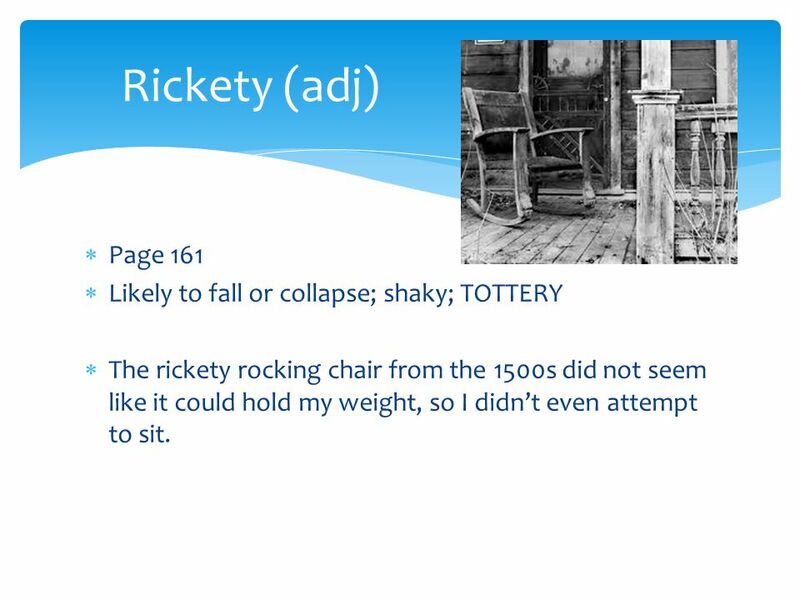 The rickety rocking chair from the 1500s did not seem like it could hold my weight, so I didn’t even attempt to sit. 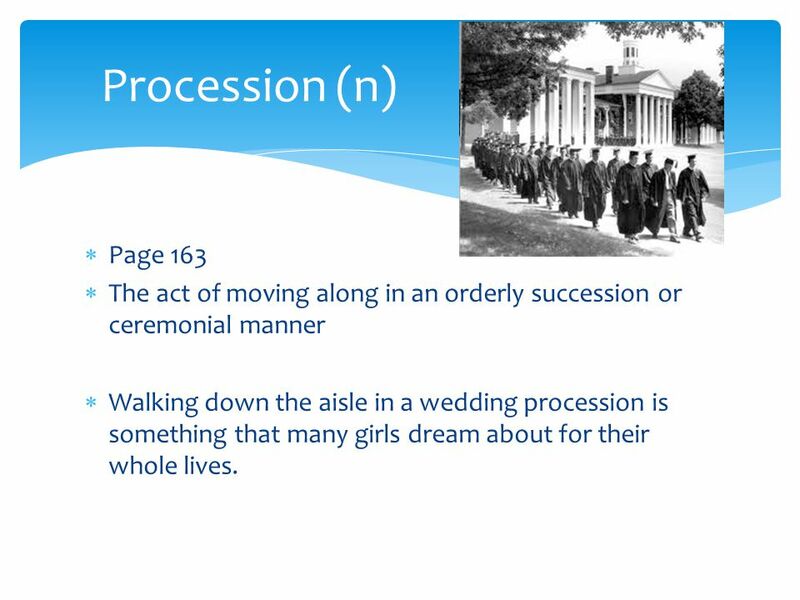 33 Procession (n) Page 163 The act of moving along in an orderly succession or ceremonial manner Walking down the aisle in a wedding procession is something that many girls dream about for their whole lives. 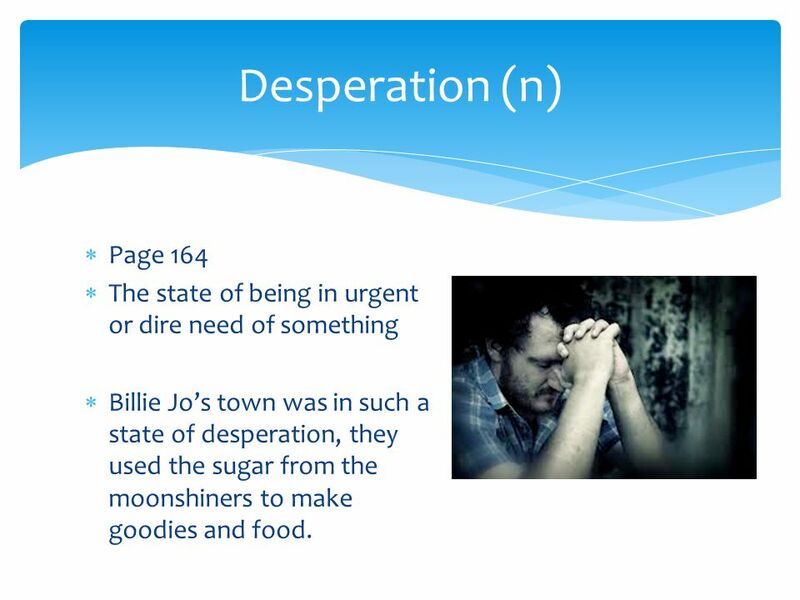 34 Desperation (n) Page 164 The state of being in urgent or dire need of something Billie Jo’s town was in such a state of desperation, they used the sugar from the moonshiners to make goodies and food. 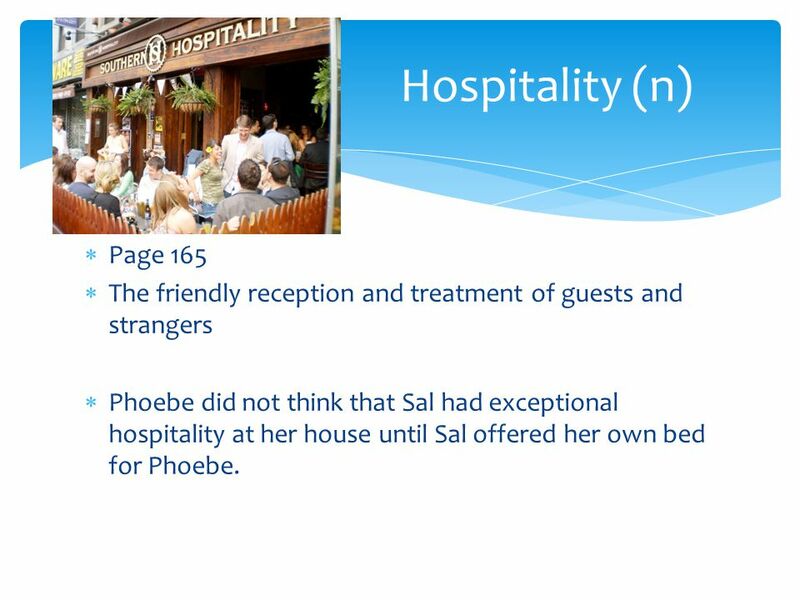 35 Hospitality (n) Page 165 The friendly reception and treatment of guests and strangers Phoebe did not think that Sal had exceptional hospitality at her house until Sal offered her own bed for Phoebe. 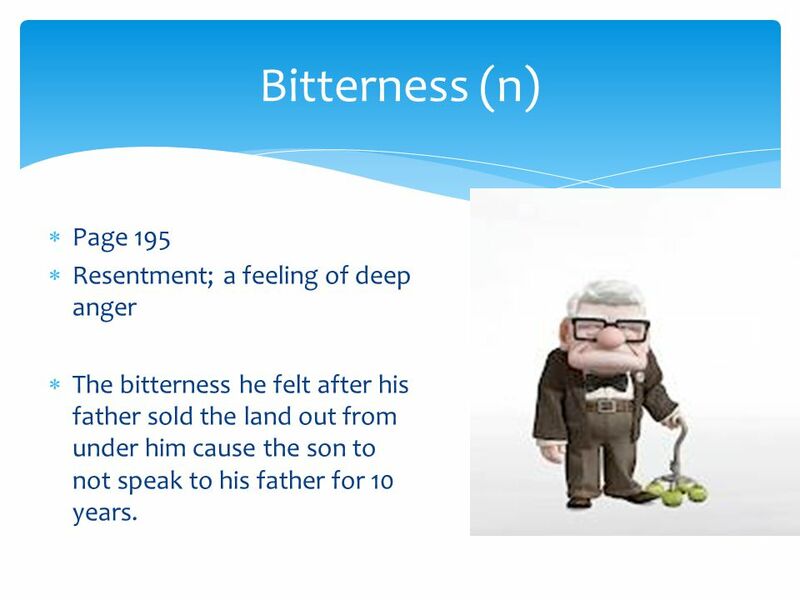 The bitterness he felt after his father sold the land out from under him cause the son to not speak to his father for 10 years. 37 Tumbleweed (n) Page 202 Like a detached thistle blowing in the wind. 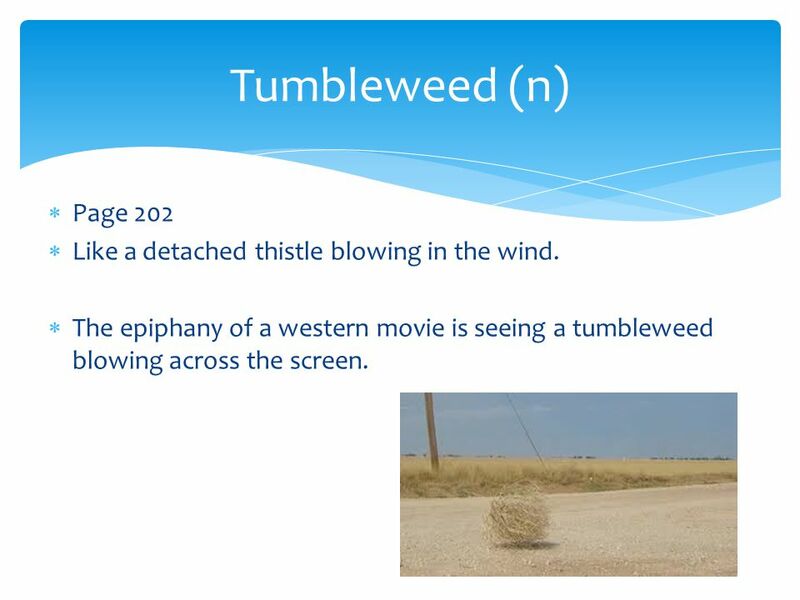 The epiphany of a western movie is seeing a tumbleweed blowing across the screen. 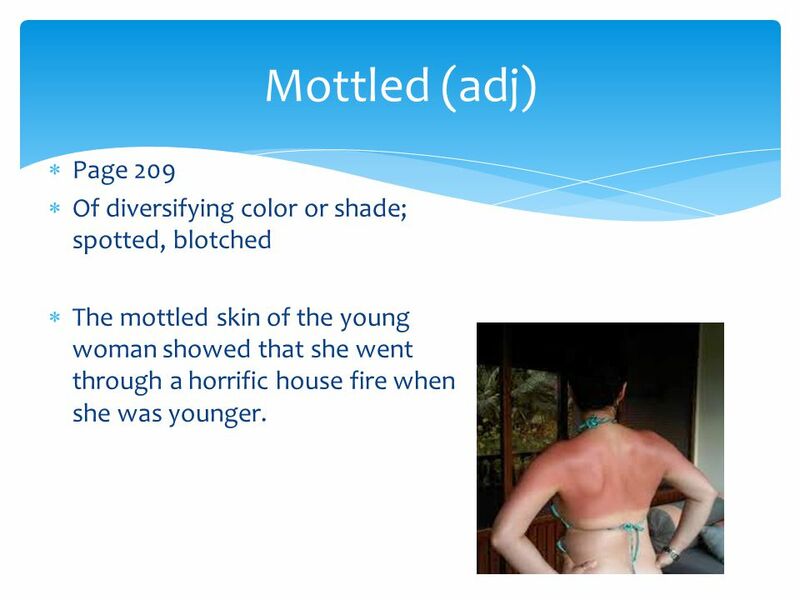 38 Mottled (adj) Page 209 Of diversifying color or shade; spotted, blotched The mottled skin of the young woman showed that she went through a horrific house fire when she was younger. 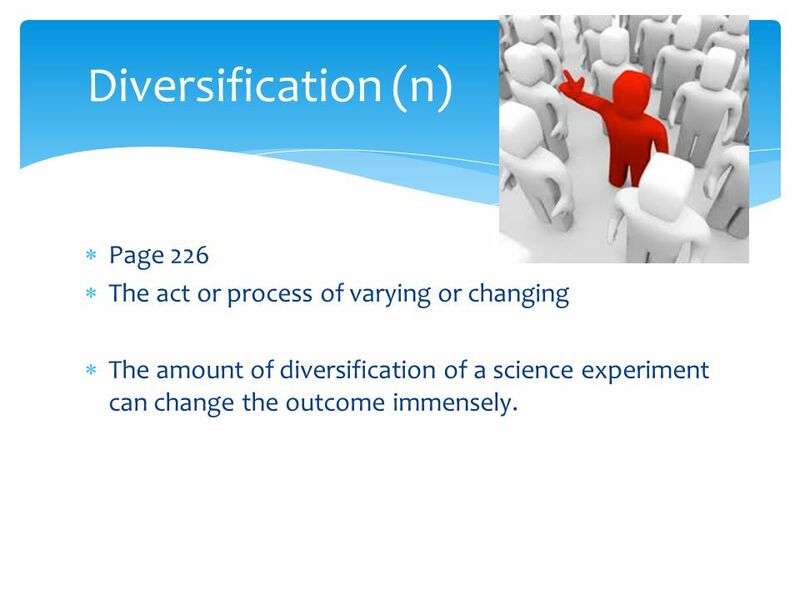 The amount of diversification of a science experiment can change the outcome immensely. 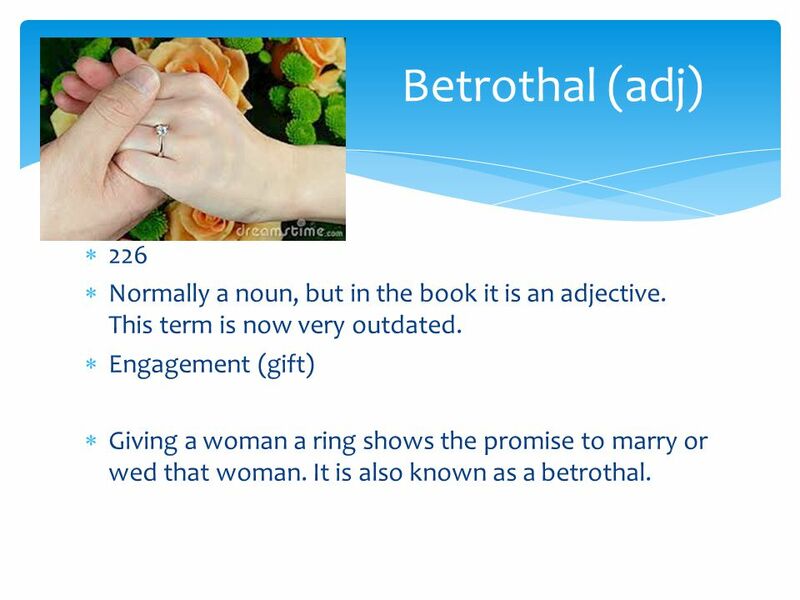 40 Betrothal (adj) 226 Normally a noun, but in the book it is an adjective. 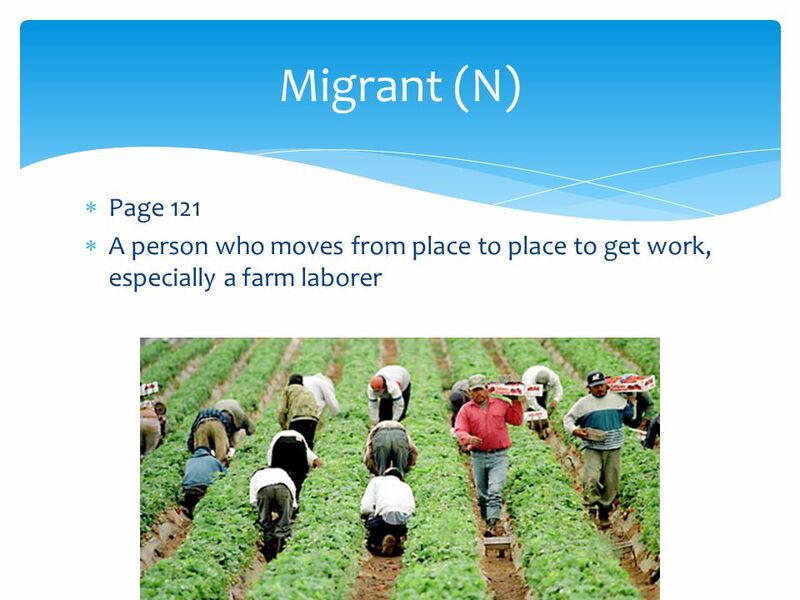 This term is now very outdated. Engagement (gift) Giving a woman a ring shows the promise to marry or wed that woman. 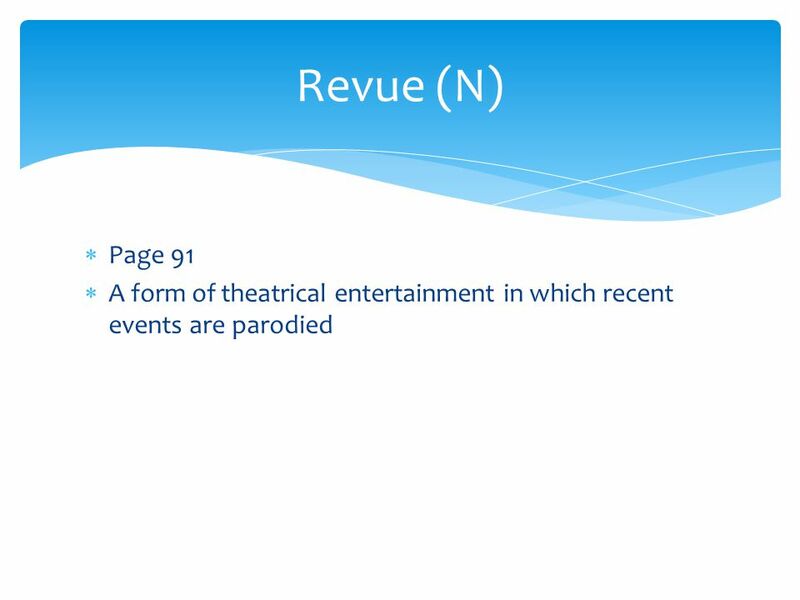 It is also known as a betrothal. 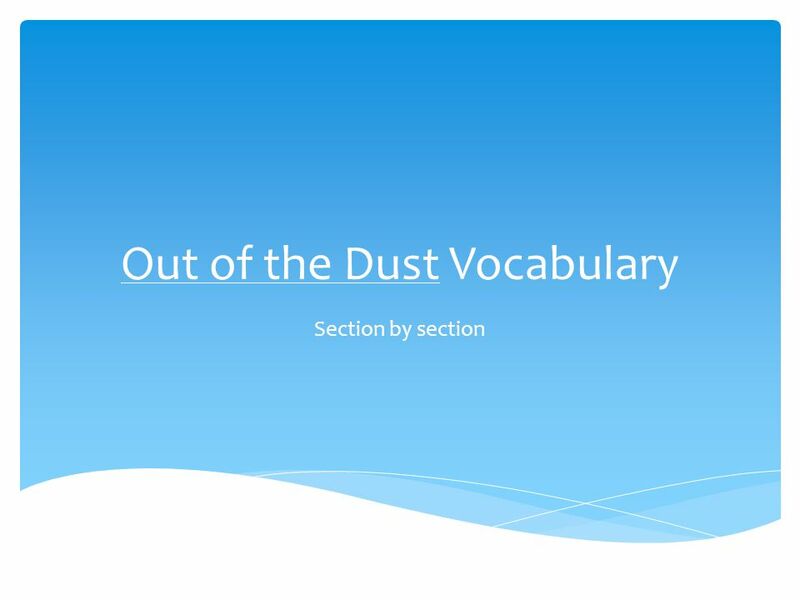 Download ppt "Out of the Dust Vocabulary"
Mr. Putter and Tabby Fly the Plane by Cynthia Rylant iIlustrated by Arthur Howard. FORGET doing FORGET doing FORGET to do FORGET to do VERBS FOLLOWED BY BOTH A GERUND AND AN INFINITIVE WITH A CHANGE IN MEANING GO ON doing GO ON doing. All Kids Have Feelings By: Perry Browne Students Participating in School Counseling. Book p.38 How many pets are in the pet shop? What may we see there today? Are there rabbits and mice hamsters and rats sleeping in nests of hay? Is there. Ah, Music! 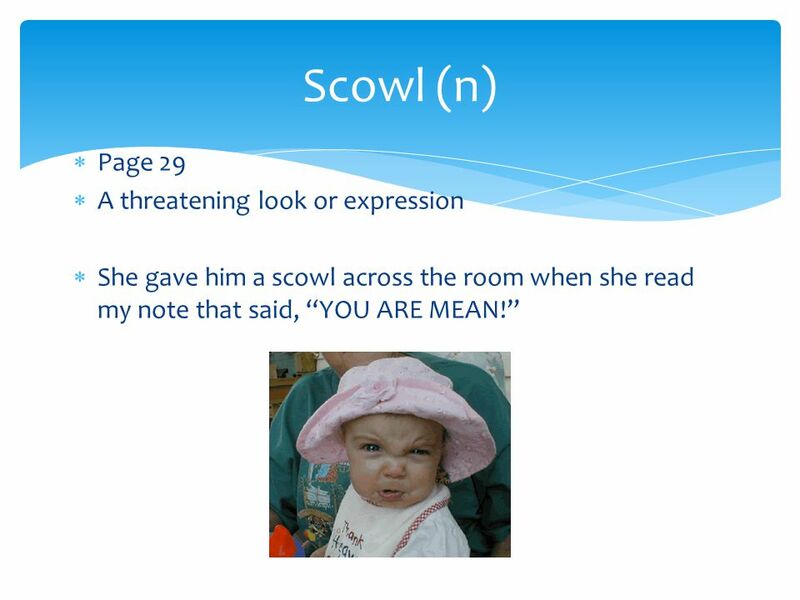 *Robust Vocabulary* Created By: Agatha Lee January 2009. “I don’t want to be a night bird,” Plop told his mummy. “Dark is nasty.” “You don’t know that,” she said. “You’d better find out about the dark before. By: Mr. Menjivar. Advisory Development Table of Contents DateTitle Page # 08/15/11Advisory Training1 08/19/11Who are the Copilots in My Life?2 08/23/11Oral.